For this week's edition of our series, we have a pair of well-known tech names and a popular fast-food restaurant operator. Don't look now, but we're just about to dive into the holiday season. Somewhat ironically, this usually isn't the best time for dividend raises since it falls between earnings seasons. But perhaps this year will be different, as several familiar names on the stock exchanged have declared raises. Could this trend continue? Income investors will certainly be hoping so. Anyway, here are my three chosen lifters from last week. IT giant HP (NYSE:HPQ) is growing its quarterly dividend taller. The company declared its new payout will be just over $0.13 per share, a 7% increase over its predecessor. This comes in advance of HP's Q4 and fiscal 2016 results. Investors will be crossing their fingers for a performance like the company's third quarter. In Q3, per-share earnings grew a very robust 37% on a year-over-year basis. It's no wonder the stock has been such a hot ticket lately. This despite a 4% decline in top-line revenue due largely to weakness in HP's printer division. The company's recent $1 billion-plus deal for Samsung's printer operations -- which buys that company's strong lineup of multifunction printer technology, and a host of patents -- should help alleviate that problem. HP might not operate on the most exciting end of the IT spectrum, but the fairly straightforward technology in which it specializes is profitable. The company is comfortably in the black, and its free cash flow is more than sufficient to support its dividend. I think this payout will be safe for quite some time. HP's new dividend is to be dispensed next Jan. 4 to investors of record as of Dec. 14. 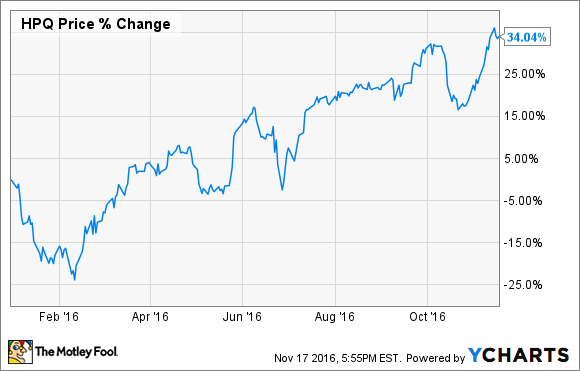 At the most recent closing stock price, it would yield 3.3% -- well above the current 2.1% average of dividend-paying stocks on the S&P 500. Elsewhere in the tech sector, we have NVIDIA (NASDAQ:NVDA). The graphics hardware specialist has lifted its quarterly distribution by 22% to $0.14 per share. Like HP, NVIDIA is coming off a strong quarter. That's actually a bit of an understatement -- during Q3, it notched record highs for revenue, per-share earnings, and gross margins. Revenue blasted 54% higher (to $2.0 billion) on a year-over-year basis, while net income more than doubled to $542 million. It was no wonder, as revenue from the Tegra processor line rose by 87%, and NVIDIA's data-center services revenue tripled. The good times are expected to continue, at least into the current quarter. The company is projecting that Q4 revenue will see a 50% rise to "near" $2.1 billion, with per-share net profit more than doubling to $0.82. As revenue and profit go, so go operating and free cash flow. Both have seen pronounced upticks from this recent success and are now above $1 billion on a trailing-12-month basis. This is more than enough to support the company's dividend, even at the newly enhanced amount. 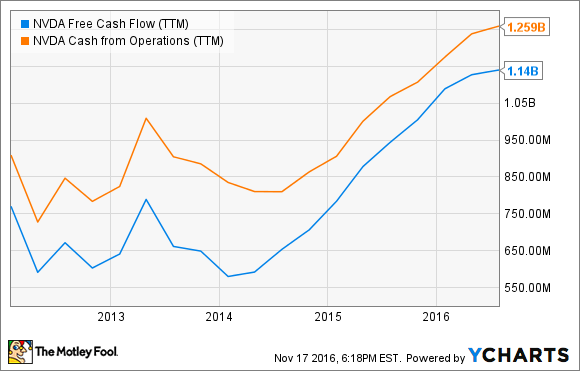 NVDA Free Cash Flow (TTM) data by YCharts. NVIDIA will pay its next dividend on Dec. 19 to stockholders of record as of Nov. 28. It would yield a theoretical 0.6% on the latest closing stock price. Classic fast-food burger restaurant operator Wendy's (NASDAQ:WEN) just slapped an extra patty onto its dividend. The company's next quarterly payout will be just over $0.06 per share, an 8% increase over the existing figure. With consumer tastes leaning more toward healthier food options these days, Wendy's has done a pretty good job of keeping up its results. It has pushed its value options, which have obviously helped get customers through the door while keeping the company in the black. In its most recently reported quarter, Wendy's reported a 22% slide in revenue (to $364 million). But then again, its company-owned restaurant count fell by 433 as part of a continuing effort to shift ownership to franchisees. The market anticipated this; that $364 million topped the average analyst expectation of $350 million. Meanwhile, the net profit of just under $49 million also beat estimates. Recently, an ambitious $1.4 billion stock repurchase program helped plunge free cash flow into the red. Fortunately there's only around $150 million left of that initiative, which should help relieve the pressure on finances. And, of course, it should leave more room for future dividend hikes. 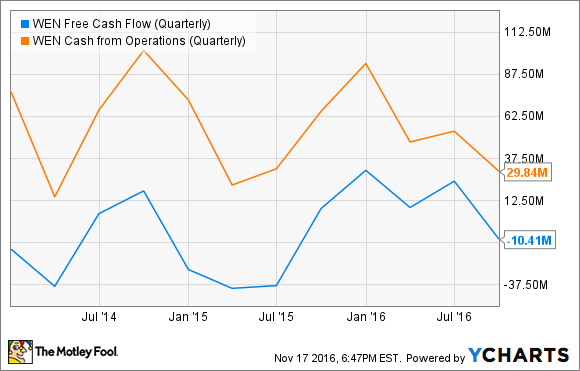 WEN Free Cash Flow (Quarterly) data by YCharts. Wendy's upcoming distribution will be paid on Dec. 15 to shareholders of record as of Dec. 1. At the current share price, it would yield 2.1%.